The runner-up will also receive £250 (apx. 2,720 Rand), as well as DVD publication. Films should be no longer than 25 minutes but can be any genre including artists' film, music videos, dance films, horror and comedy or anything you can think of! Entry is £15 (apx. 160 Rand) per film. No limit to the number of entries permitted. 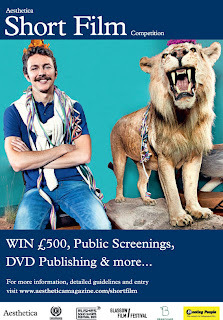 Please visit www.aestheticamagazine.com/shortfilm for more information and to submit. Deadline 30 April 2011. We are writing to invite you to join Redi Tlhabi and her guests as part of the studio audience this Wednesday 13th April for the recording of 3 episodes of the Redi show on Mzansi (DSTV Channel 107). - Lucky Mazibuko, Sowetan columnist, now celebrating 20 years of living with HIV. Recording starts at 2pm this Wednesday 13th April at the Sasani Studios in Highlands North, Johannesburg. You are welcome to come for just one or two of the topics, or for all three. If you'd like to join us, please email broad.daylight.films@gmail.com with your name and cell number, indicating which shows you plan to attend. Places are limited and will be reserved on a first-come-first-served basis. This month marks the 17th year of our freedom. On the 27 April 2011 we shall celebrate our collective achievements of sustained peace, unity, the restoration of human dignity to all South Africans and an inclusive citizenship based on the principles of non-racialism, non-sexism and democracy. In the past 17 years we have worked together to deepen this democracy and indeed this year as we prepare for local government elections let us be proud of what we have accomplished together. The theme for this year’s celebrations is “Working together to unite the nation, promote democracy and protect freedom.” This theme is a reminder of the sacrifices of our people in the struggle for a free and just South Africa. We call upon all South Africans to put their differences aside and to work together to build this country – united as we are, even in our diversity. We can only protect freedom if we do so together conscious of our hard-won rights and eager to entrench this freedom and to ensure that the gains also become sustained social, economic and cultural development for all our people. Government calls on all South African to join in celebrating National Freedom Day at the Union Buildings in Pretoria on Wednesday 27 April 2011 (full details of activities planned for the month are in your pack). This event will be addressed by President Jacob Zuma and will also include a full military parade and a cultural programme. Government also reaffirms its commitment to consolidate democracy and promote cultural diversity and social cohesion in South Africa. We celebrate the fact that we live in a system that guarantees that never again will our humanity be taken away, irrespective of race, gender, creed or sexual orientation. We have reached this point in our history through collective will and action, through hard work and sacrifice, through national creativity and through innovation. We can be proud that we are a people with a strong sense of self-worth and a national identity that enables us to be active agents of change. As Government we continue to play a critical role in promoting social cohesion, nation building and building civic pride – all of these contribute towards the building of a national democratic society. We have embarked on the Magnificent Friday initiative aimed at mobilising all South Africans behind our national netball team, the cricket team and the rugby team. We are also initiating Community conversations led by Provinces on how to build a more caring society characterised by social cohesion. These provincial gatherings will culminate in the National Summit of Social Cohesion to be held in the second half of this year. We call on all South Africans to exercise their right and responsibility topromote democracy and protect freedom by participating at the municipal elections later this year. We all have a responsibility to continue working together to build our country. Elections are a crucial element of democracy and it is the responsibility of all eligible persons to go and vote. All of us have to oblige by and respect the rules of the election period to ensure that we continue having free and fair elections. Let us work together to unite the nation, promote democracy and protect freedom. The Department of Arts and Culture is tasked with the responsibility to develop and preserve South Africa’s culture, to ensure social cohesion and to nation-building. One of the critical areas of focus for the Department as it delivers on its mandate is to unleash the potential of the arts, culture and heritage sector to contribute to economic growth and job creation. This is particularly important in light of the recent pronouncement by President Zuma in the State of the Nation Address that the primary focus of the work of government during this period is on job creation. It is also our view that the arts, culture and heritage sector has a meaningful contribution to make towards the achievement of the goals of the New Growth Path; specifically the creation of 5 million jobs within the next ten years. Research in many parts of the world, including in countries such as Canada, United Kingdom and India, shows that the cultural and creative industries is a major contributor to economic growth and job creation. This has earned the sector the title of being referred to as the “Golden economy”. In line with this international trend, there is also growing consensus in our country that the cultural and creative industries are a significant contributor to economic growth and job creation. At its February Lekgotla, Cabinet identified the cultural and creative industries as one of the sectors that can contribute to the objectives of the New Growth Path; especially the creation of new jobs. As the President indicated during the State of the Nation Address; the craft sector alone contributes more that R 2 billion to our country’s Gross Domestic Product. In addition this sector provides jobs and income for approximately 38 000 people through an estimated 7 000 small enterprises. (Source: DTI). We estimate that Technical Services, which include stage construction, lighting and sound engineering, are worth R7 billion per annum. Last year a research report indicated that the Cape Town International Festival contributed more than R475 million to the economy of Cape Town and created a total of 2 000 jobs. Judging from this year’s attendance and enthusiasm, I have no doubt that even these figures will be surpassed. These (preliminary) numbers point to the vast potential of the Golden economy in South Africa. Yet the sector generally is not considered to be visible and there is a need for the research in the sector to be collated and analysed to provide an accurate picture of the whole sector and the contribution it makes to our national life. Overlapping functions between role players need to be addressed as soon as possible. It is necessary that a unified framework be adopted and our priority is large scale interventions that can make a difference on a mass scale. It is for this reason that in November this year I appointed a creative team to draft a strategy on how to unleash the potential of the cultural and creative industries to contribute to economic growth and job creation. After a process of consultation with our agencies and provincial departments of Arts and Culture, we are delighted to announce that the strategy is now ready to be presented to all our stakeholders at a National Summit on the Cultural and Creative Industries to be held from the 14th to the 15th of April this year, at the Newton Cultural Precinct in Johannesburg. Together with our Agencies, National Departments, Provincial and Local Government and key stakeholders we shall look at new potential interventions that facilitate employment creation on a large scale. Out of this Summit we hope to emerge with a number of resolutions that we will implement collectively with all stakeholders in the sector with a view to strengthen the contribution of the creative and cultural industries in the economy. Most importantly this Strategy will spell out in detail how the sector will contribute to the national effort to create 5 million jobs within the next ten years as outlined in the New Growth Path. Clearly, the arts and culture sector is an emerging economic contributor, a golden economy waiting to shine! Our task is to nurture new enterprises in the cultural and creative industries as well as drive the expansion of existing initiatives. We would like to establish nationally supported cultural precincts. We are already in dialogue with the provinces about the location of such areas of culture and the feasibility of implementing them. Linkages can be made between historical sites, monuments, museums and theatre complexes so that audiences and patrons are attracted to the widest and most diverse possible offerings of the arts, culture and heritage sector. We propose the establishment of arts and cultural product hubs offering as many categories of products as possible. The sites for these hubs would encourage patronage, extend geographical spread and association to important cultural, archaeological and historical sites. We shall be mindful of the rural development priority of government as we undertake this task. Good work has been done by the Department in partnership with the National Heritage Council on the National Heritage Liberation Route. Just last week I was invited to speak at the Gauteng Liberation Heritage Route conference. which is part of the consultative processes, done by the Council to encourage public participation in this initiative. These projects highlight liberation history and ensure that this rich heritage is preserved and is accessible to all. Some of the legacy projects include Constitutional Hill, Freedom Park, Robben Island, Luthuli Museum, Mandela Museum and so forth. The full realisation of these projects could have a social and economic impact on the communities in which they reside. In our country, there is a need for access by arts and culture practitioners to markets in which they can sell their products and thus earning a decent living from their talents. Therefore we propose that an institution be established to complement existing informal and small scale sourcing of products and services that is currently taking place. This new institution would source out products, activities and experiences for dissemination and distribution to audiences in towns and cities throughout the country. This institution would also establish an inventory of all the sources of products, activities and experience that would allow for a wider choice for both international and domestic consumers. In our view, this would lead to an increase in demand as a result of the increased choice, thus bringing more economic benefit to artists. It is proposed that an umbrella fund which we shall coin an ‘Art Bank’ be re-established as a funded commercial venture to receive earmarked funding for qualifying projects. Together with the Deputy Minister, I would like to meet the business community to solicit support for this proposal. Also linked to the development of the strategy, is the establishment of the National Skills Academy for the Arts. The Academy will coordinate and integrate the various arts training initiatives in the country. It will become a “Center of Excellence” responsible for producing the best in our country that are capable of competing successfully on the world stage. This is our long term strategy and for this we need to work with other National Departments. We are collaborating with the Department of Basic Education to include in the curriculum, visual arts and aspects of drama including providing learners a chance to learn to play a musical instrument. We are engaging with the Department of Higher Education to ensure co-ordination and collaboration in all institutions in the arts, culture and heritage education sector. We intend adopting a programmatic approach to youth employment including increasing access to bursaries and internships. Already we have made some progress in this regard with R9 million allocated for skills development in the heritage sector. These are some of the key aspects of our new strategy that will come under discussion at this consultative event. The main aim is to create synergies and to rationalise and clarify roles so that government in partnership with the sector can move ahead with great clarity and precision. We invite your participation in this repositioning of the role of the arts, culture and heritage sector. In presentations at the Independent Communications Authority of South Africa’s (ICASA) digital dividend workshop in Johannesburg on 7 April, both M-Net and e.tv pointed out that it was premature to talk about how to allocate the digital dividend – the frequency spectrum that will be freed up once South Africa migrates to digital terrestrial television (DTT) – before digital migration was even on the starting blocks. The date for the commercial launch of DTT is still to be set by the Department of Communications (DoC) in consultation with ICASA. In the meantime, Minister of Communications Roy Padayachie has set the deadline for the switch off of the analogue signal for December 2013. M-Net’s head of Regulatory Affairs Karen Willenberg stressed that three preliminary issues need to be resolved before ICASA decides how to allocate the digital dividend. Said Willenberg: “We believe that spectrum is the fuel that will drive change and development in South Africa and that consumer demand will continue to grow. 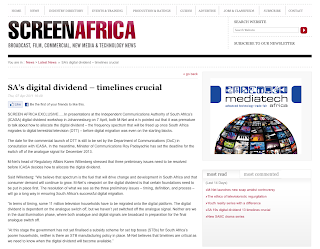 M-Net’s viewpoint on the digital dividend is that certain foundations need to be put in place first. The resolution of what we see as the three preliminary issues – timing, definition, and process – will go a long way in ensuring South Africa’s successful digital migration. “In terms of timing, some 11 million television households have to be migrated onto the digital platform. The digital dividend is dependent on the analogue switch off, but we haven’t yet switched off the analogue signal. Neither are we in the dual illumination phase, where both analogue and digital signals are broadcast in preparation for the final analogue switch off. The rest of the article, including e.tv's perspective here. Bo Stehmeier, director of sales at Off the Fence, was the main speaker at a Documentary Filmmakers Association workshop on Commercial Documentary Distribution and Finance. 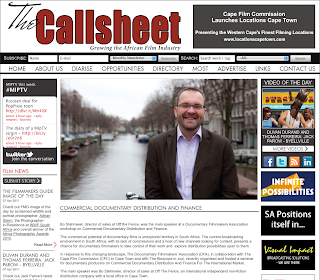 The commercial potential of documentary films is unexplored territory in South Africa. The current broadcasting environment in South Africa, with its lack of commissions and a host of new channels looking for content, presents a chance for documentary filmmakers to take control of their work and explore distribution possibilities open to them. In response to this changing landscape, The Documentary Filmmakers’ Association (DFA), in collaboration with The Cape Film Commission (CFC) in Cape Town and with The Bioscope in Jozi, recently organised and hosted a seminar for documentary producers on Commercial Documentary Distribution And Finance For The International Market. The main speaker was Bo Stehmeier, director of sales at Off The Fence, an international independent non-fiction distribution company with a local office in Cape Town. The seminar was initiated by DFA treasurer, Pascal Schmitz, after he met Bo at IDFA in December 2010. The seminars in Jozi and Cape Town had different panelists, but the learning in both centres was equally invaluable. Bo allowed both newcomers and old timers of filmmaking to get their heads around the until-now distant world of distribution and international financing. He began by encouraging documentary filmmakers to embrace the current uncertainties in the South African filmmaking landscape. He said the situation reminded him of the UK eight years ago, where, within three years, the most profitable export was television shows. Producers in the UK embraced their intellectual property rights and exploited opportunities to earn from product sales. “The stars are aligning themselves here in South Africa and it’s your responsibility to research the opportunities available,” he said. AfricAvenir organises African Perspectives, a monthly African film series in Windhoek, Namibia that started in 2007. They’ve screened films like Oliver Schmitz’ Hijack Stories; Darrell Roodt’s Faith’s Corner; Wanuri Kahui’s From a Whisper; and Ousmane Sembene’s Moolade. Full article at The Call Sheet and Afric Avenir's web site here. To significantly raise the profile of documentary films and filmmakers by publicly promoting awareness, support and viewership of Canadian and international documentary films across Canada and the world. * Once known internationally for its leadership role in development and innovation, documentary filmmaking in Canada is in peril of disappearing due to a lack of financial support for its creation. * Over the past 5 years more than 2,000 people have been forced to leave their jobs in documentary production even before the effects of the economic downturn hit. * Attendance at Hot Docs, Canada’s largest documentary film festival, has increased by an astounding 750% over the past decade. *Source: Getting Real 4: an Economic Profile of the Canadian Documentary Production Industry. Download a PDF of the report at www.docorg.ca/en/broadcasting. The rest of the interview over here. Alert! The Open Book Cape Town literary festival, first mentioned in these annals, has a wee update for you, dear reader – in the form of the announcement of our first raft of authors who will be, erm, rafting in for the 21 – 25 September gig. They are plentiful, and they are major. Whoop! Oh, and we have a shiny new logo, too. Like it? Here’s the press release that went out this afternoon, which tells all. Feast your eyes! 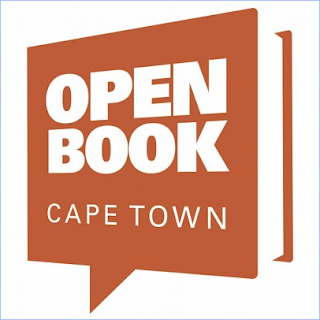 Internationally-acclaimed novelists Jeanette Winterson, Paul Harding and Earl Lovelace are set to appear at Cape Town’s inaugural Open Book literary festival this September. The three writers’ bright careers present enticing contrasts for the city’s book lovers. Winterson, born in Manchester, UK, won the Whitbread Prize in 1985, and has published over a dozen books, along with numerous scripts and play adaptations. She is best known for novels like Oranges are Not the Only Fruit and The Passion but also writes children’s books and fiction for young adults, and was awarded an OBE for services to literature in 2006. Winterson will launch her forthcoming novel, Why Be Happy When You Could Be Normal? at Open Book. Harding, meanwhile, of Massachusetts, USA, has just got his start – which has been an auspicious one, to say the least. With his first novel, Tinkers, he joins the likes of Cormac McCarthy and Philip Roth in winning the Pulitzer Prize, an extraordinary honour for a debut work of fiction, which was also named one of the Hundred Best Novels of 2009 . For National Film Board of Canada chair Tom Perlmutter, it’s shaping up to be a good week on the interactive media front. The public filmmaker’s interactive documentary HIGHRISE/Out My Window on Monday won the international Emmy for best digital program: non-fiction category at MIP-TV. And the NFB has been shopping 14 interactive productions to international broadcasters at MIP Doc and MIPTV this week, for content and format licensing. HIGHRISE, directed by filmmaker and digital media creator Katerina Cizek and produced by Gerry Flahive, uses interactive 360° photography, video, text and music in 49 vignettes to capture life in highrise apartments in 13 cities. 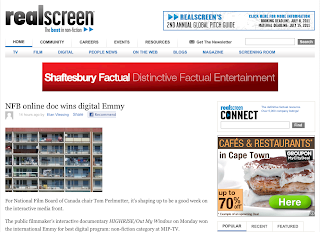 For Perlmutter, the MIPTV showcase of the NFB’s interactive media is confirmation that Canada’s public filmmaker is well on its way to making a long-standing, and at times painful, shift from a pure documentary, animation and feature film producer to a trailblazer in online digital media. “When I came into the NFB at the time as head of English programming, it overwhelmed me. There was so much talent and excitement, but all that people knew about the film board was nostalgia,” Perlmutter told realscreen’s sister publication Playback Daily. So he turned an NFB from an institution whose audience honored its past to one committed to next-generation story-telling on the Internet and other emerging digital platforms, including smartphones and tablets. 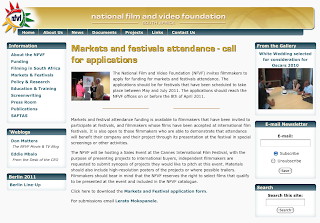 The National Film and Video Foundation (NFVF) invites filmmakers to apply for funding for markets and festivals attendance. 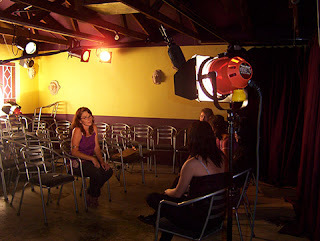 The applications should be for festivals that have been scheduled to take place between May and July 2011. The applications should reach the NFVF offices on or before the 8th of April 2011. Markets and festival attendance funding is available to filmmakers that have been invited to participate at festivals, and filmmakers whose films have been accepted at international film festivals. It is also open to those filmmakers who are able to demonstrate that attendance will benefit their company and their project through its presentation at the festival in special screenings or other activities. The NFVF will be hosting a Sales Event at the Cannes International Film Festival, with the purpose of presenting projects to international buyers, independent filmmakers are requested to submit synopsis of projects they would like to pitch at this event. Materials should also include high-resolution posters of the projects or where possible trailers. Filmmakers should bear in mind that the NFVF reserves the right to select films that qualify to be presented at the event and included in the NFVF catalogue. Click here to download the Markets and Festival application form. Looking at Felicia Day, you’d never guess that this petite redhead from Huntsville, Alabama, represents the single biggest threat to the global television industry. At just 29, this actress turned screenwriter and producer has created a web series that has been watched more than a ­quarter of a billion times. Her series, called The Guild, was made on the most shoestring of budgets. Speaking at the South by South West Interactive festival last month, Day chuckled as she recalled pilfering food from another set on which she was working at the time. Shot in her house, using borrowed equipment and her friends as cast members, the show epitomises the DIY spirit of a new generation of independent producers. In 2007 Day was already a successful actress, with parts in shows such as Buffy the Vampire Slayer and House, when she decided to use the spare time between acting gigs to write and produce her own series. Working from the age-old premise of “write what you know”, Day decided to create a series about online gamers. “I’ve been an online gamer my whole life and I’ve been on the net since the beginning. I had a Prodigy account,” says Day. The choice was fortuitous for a number of reasons. 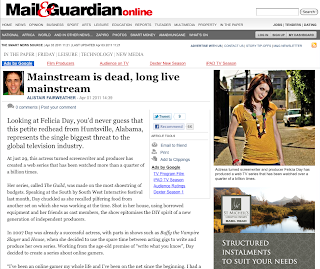 First, she had a built-in audience of extremely connected and net-savvy viewers -- online gamers. Second, because of her strong, organic connections to social media channels such as forums and Twitter she had an instant marketing strategy. 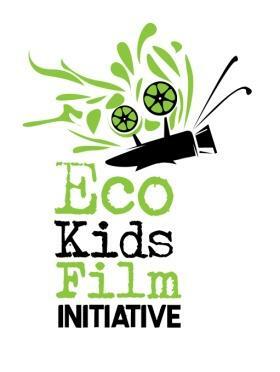 The organizers of the Eco Kids Film Initiative, in partnership with Cape Town non-profit While You Were Sleeping, are happy to announce that the call for entries for the first annual festival is now closed. We are excited about the diverse range of entries that we have received, including animations, documentaries and short narratives, some from as far afield as Kenya and the Democratic Republic of Congo. The final programme will be released in August.